Latest Transition Town Hastings news! HOT’s Zelly Restorick watched the inspirational documentary, Demain recently at The Electric Palace – about sustainable living and what we can do to survive and thrive in the face of climate change and other environmental threats. For her, the delightful highlight of the film was Rob Hopkins, Founder of the Transition Town movement saying that things don’t need to be all gloom and doom. Things could be FABULOUS! 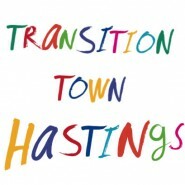 Transition Town Hastings, committed to community, sustainability and a fairer place to live for everyone, is linked to many different groups and individuals locally who are working for and connected with the issues TTH cares about: their latest news concerns creating a fairer food system, the planet, green energy, reducing fuel poverty, community connection, permaculture, clean beaches, wild writing, re-fillable water bottle scheme and the next Green Drinks gathering.